Azadeh Parsapour, the Iranian publisher of work censored by Tehran, talks about bringing suppressed writings to a Persian-language audience. 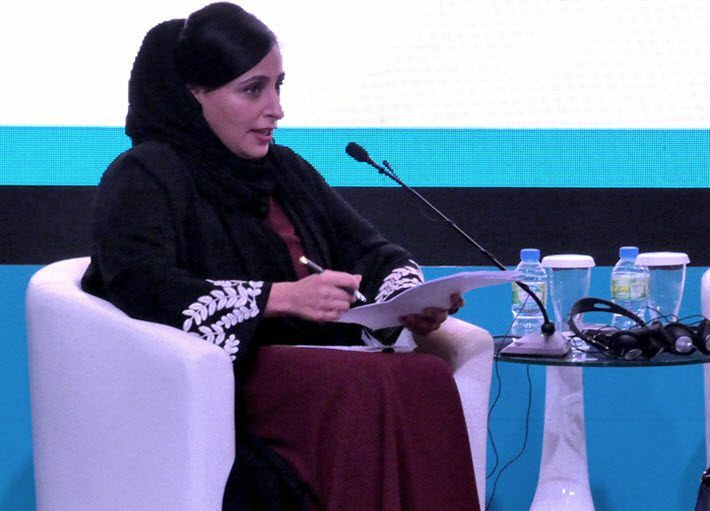 When the United Arab Emirates’ Sheikha Bodour Al Qasimi convened a panel on challenges to the freedom to publish at the Sharjah International Book Fair Publishers Conference 2018, a two-time International Publishers Association (IPA) Prix Voltaire nominee was on stage with her: Azadeh Parsapour. 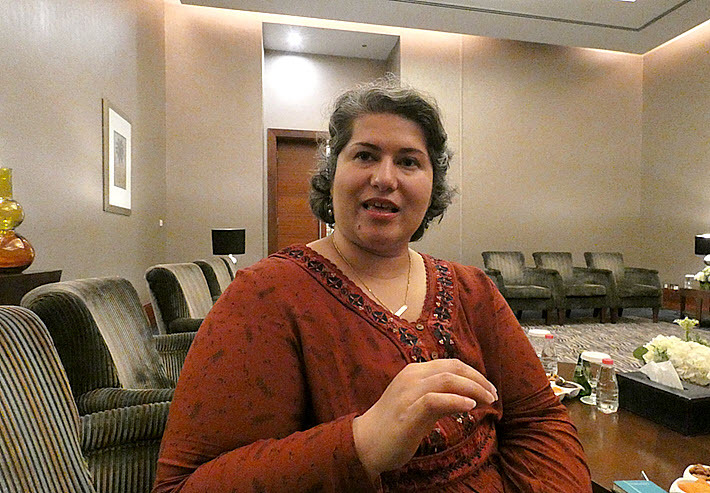 Parsapour is the founder of the London-based Nogaam Publishing, a press launched in 2012 to digitally produce Farsi writings that are censored in Iran. Nogaam makes them available free of charge under a Creative Commons license. Iranian readers can access more than 40 titles so far produced by Nogaam on topics controlled in Tehran including immigration, censorship, LGBT issues, underground music, women, relationships, war, and extremism. 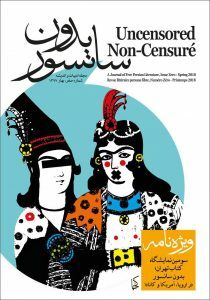 Parsapour is also behind the Tehran Book Fair Uncensored—sponsored by the International Alliance of Independent Publishers—which is designed to help Persian-language publishers, authors, and translators meet in European and North American cities to disseminate books in Persian, including those censored in Iran. In September, the Association of American Publishers at its annual meeting in New York City named Parsapour the recipient of its International Freedom To Publish Award, named for Jeri Laber. Because she’s unable to travel to the United States on her Iranian passport, Parsapour sent a taped message to the association’s meeting in which she explained that her name, Azadeh, means free human. 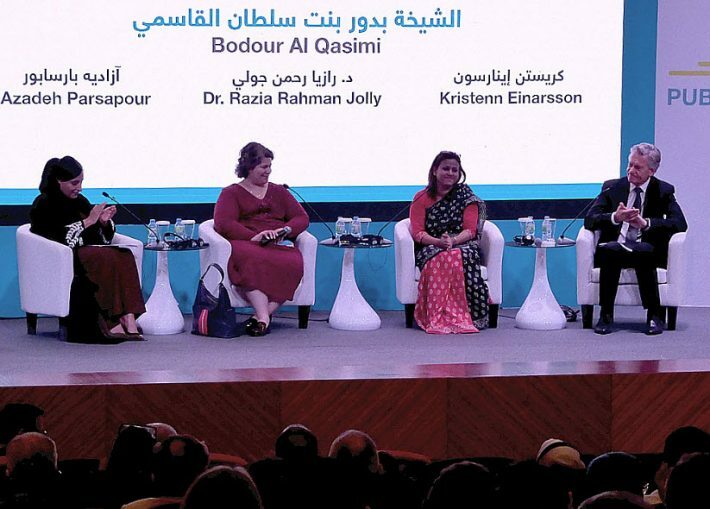 Joining Bodour onstage was Kristenn Einarsson, who chairs the IPA’s Freedom To Publish committee, and Razia Rahman Jolly, the widow of Bangladeshi publisher Faisal Arefin Dipan, who was murdered at his office, allegedly by religious extremists, in October 2015. During her conversation onstage, Parsapour explained that about half of the work that Nogaam produces is censored writings coming from writers who live and work in Iran. The rest is written by Iranian writers in diaspora, those living elsewhere and unable to get their work past Tehran’s state censors for publication in-country. Seated between Bodour and Einarsson, Rahman Jolly and Parsapour offered two distinct and compelling views of what censorship means in literature today. “I lost everything,” Rahman Jolly said, when her husband was killed. And she has trained herself to carry on his publishing work since his death, opening a reading café for young people, trying to build a cultural environment to promote free inquiry and critical thinking in Bangladesh. Parsapour, on the other hand, has given up living in her own country, moving to London to create an island of contemporary Iranian literature that would never see publication if her Nogaam Publishing program didn’t produce it. When Publishing Perspectives spoke with Parsapour, she proved to be a warm, affable personality who is constrained in ways many of us don’t experience. “For one thing,” she said, “I cannot travel to Iran” and must live in self-imposed exile. “I have been involved with many freedom of speech projects, human rights projects—I cannot name them on the record—many things that are not approved” by Tehran. And so a return to the country would be unwise. “The other thing I have to worry about,” she said, “is how dangerous for me it might be for someone I’m working with in Iran. It gets really dangerous” for a writer still in Iran whose work, she said, perhaps critical of the regime, is being published digitally in Farsi and thus is widely available and visible. “For me, the damage is that my emotional connection with Iran is stopped” by her inability to go home. “But I’m living in a free country, I can have protection, and so forth. “But there’s always a risk. When we established Nogaam” six years ago, “we did risk assessments” and, as a result of that examination of the project, “we offer each writer we work with a chance to use a pen name if they prefer, to keep them safe. But of the 41 titles we’ve published until today, only two or three people have chosen to do that. “For one thing, the content is not that aggressive or provocative, but they have to be careful. And these writers have also said, ‘No, this is myself, this is my work, this is my story and I want to tell it,'” and they’ve gone forward with Nogaam’s publications as a point of pride and courage. “But always I worry about my writers,” Parsapour says. “Whenever I hear that a blogger has been arrested, or someone has been arrested because they tweeted something. I’m shivering all day,” worried, she says, that the detained person could be one of her writers. “And one of the problems we have is paying people we work with who are still in Iran. I can’t just to go a Western bank” because economic sanctions may preclude a bank’s ability to transmit funds into Iran. So we have to come up with very complicated and legal ways to pay people who write for the publishing house. “We also have to caution everyone about contracts with us. We say, ‘Don’t print it, don’t leave it on your desk, don’t save it on your hard drive,'” to be sure it’s not discovered by the authorities. If you think of the normal complexities of publishing a book,” in other words, Parsapour says, “we have to do double that much work because we need to do it as safely as we can. And still there’s a chance” of discovery “for fifty percent of our writers,” the ones still based in Iran. “That’s why when I was accepting the award from the Association of American Publishers, I said that most of it belonged to our writers. Because they’ve trusted us. They didn’t know us. I didn’t interview anyone for the first three or four years. No one knew who they were working with digitally” from Nogaam. “They trusted us, they were willing to publish their work with us” and take the risks. To pay for her house’s work, Parsapour uses crowdfunding, she says. And she publishes only in Farsi because the target audience is the Iranian community and translation into other languages would be prohibitively expensive for her operation. Today, she’s working on a new, related venture, as well, in that regard. “I’m starting a company like a literary agency for some of these books” so that they can find translation and readership in cultures beyond the Iranian world. “I’m working with publishers in the UK, in Germany, in different countries, so I can introduce Persian-language literature, censored or uncensored. I want to do that, just introduce these things. Stereotyping, she says, could be one of the most important things to address through such a wider circulation of some of the material she handles. Frequently, Parsapour says she’s found that people she spoke with about possible translation of Persian-language material had a pre-determined idea of what such material would be. “They want a story of a woman who comes ‘out’ and takes off her hijab and now is independent,” for example. She laughs at the thought of the cartoonish stories she knows are sometimes expected of the work she handles. The idea of placing particularly valuable literary work from the region would make her feel that she’d taken a stand for the artistry and intelligence of her writers and her culture. This was a very interesting article. I have published an Iranian author in English and I am about to publish her memoir as well. He name is Nasrin Parvaz and the novel I published for her is called The Secret Letters from X to A. It would be interesting to see if she accepts to have it published in Farsi. Hello,how i can publish my romance?that is Persian language.